Joerg Johannes of Cologne (Koeln) won the first tournament of the Open German Championship 2013 in Berlin on Saturday, 16th March 2013. Joerg defeated German Champion Peter Boecker from Dortmund with the score of 25:05 in 8 boards. Dirk Polchow of Bonn came on 3rd place. As prizes for winning the Open German Carrom Tournament of the German Carrom Federation in Berlin Joerg Johannes and Peter Boecker have won the air tickets for the participation of the Champions Championship on the occasion of the 25th Anniversary of the International Carrom Federation in Delhi, this year. 41 carrom players from different parts of Germany such as Berlin, Bonn, Darmstadt, Dresden, Dortmund, Erfurt, Gera, Hamburg, Kologne (Koeln), as well as guest players from Czech Republic, Poland, Spain and Sweden took part in the Championship tournament in a Children and Youth Centre called "Pallace". The tournament was opened by the Minister of the Indian Embassy in Berlin Mr. Amitabh Ranjan, who appreciated that the game of Carrom is developing fast in Germany and other parts of Europe. He emphasised that Carrom is a very popular indoor game in India and is playing greart social role in the society. Mr. Ranjan conveyed the good wishes of the Indian embassy and assured that the embassy will be helping Carrom activites in Germany in future. Arif Naqvi welcomed the guests and participants and also informed as a president of the Internatinal Carrom Federatio and European Carrom Confederation about the preparations of the Silver Jubilee celebrations of the ICF in October in Delhi and the 17th Euro Cup in June in Poland. 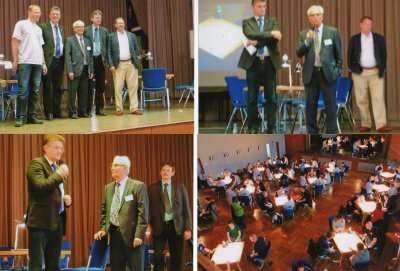 President of the German Carrom Federation Joerg Kijanski, who came from Cologne (Koeln) welcomed the guests on behalf of the GCF and informed about the programme of the Carrom activities in 2013 in Germany. The next tournament will be in April in Dortmund. President of the Polish Carrom Federation Jakub Nowakowski, who was taking part in the tournament, informed about the preparations of 17th Euro Cup and invited the players to take part in the Euro Cup from 20th to 24th June near Polish capital Warsaw. The tournament was conducted on the basis of the Swiss League system of seven rounds and a final. Ms. Gabriele Vaclavik of AIR INDIA who came from Frankfurt to attend the occasion. She appreciated the game and said that she enjoyed the matches. 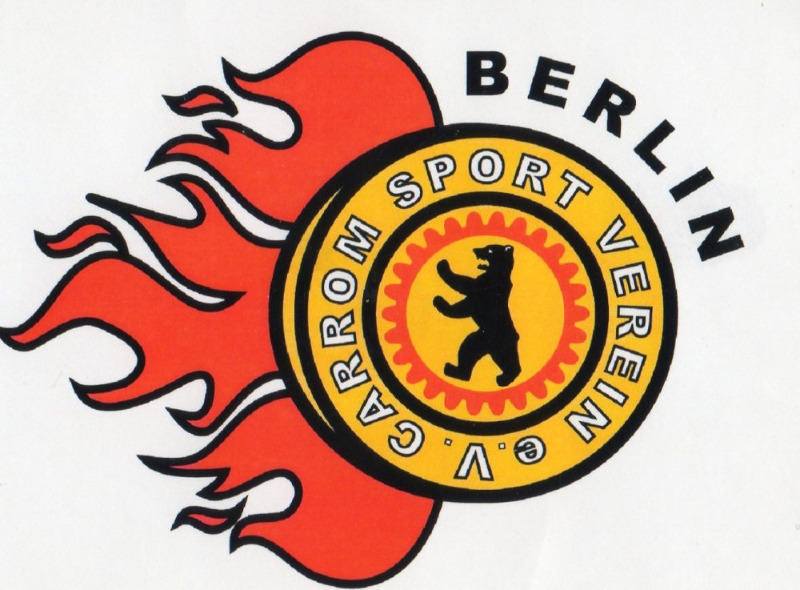 Veranstalter: Carrom Sport Verein Berlin e.V. Die ersten drei Turniertermine zur Offenen Deutschen Meisterschaft im Carrom stehen fest. 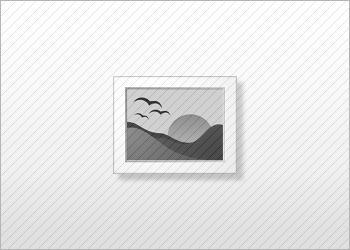 Das erste Turnier der ODM-Saison 2012 wird am 17. März in Witten (bei Dortmund) stattfinden. Nähere Infos hierzu folgen in Kürze. Das zweite ODM-Turnier am 2. Juni 2012 in Köln kann als Vorbereitung für den zwei Wochen darauf stattfindenden Eurocup genutzt werden. Ebenfalls in Köln wird das dritte ODM-Turnier - am 22. September 2012 - ausgetragen. “Mitmachen, Anfassen, Ausprobieren” – unter diesem Motto fand 2011 zum 13. Mal die YOU in Berlin statt. Seit ihrem St art 1999 in Berlin hat sich die YOU zu einem riesigen Jugendevent entwickelt. In den Segmenten music, sports, lifestyle und education können Jugendliche die coolsten Bands erleben, innovative Sportarten testen, die neuesten Trends entdecken und ihre Zukunft planen. 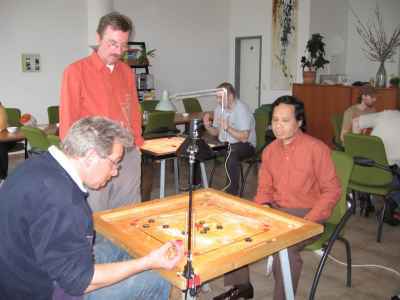 Der Carrom Sport Verein Berlin e.V. (CSV) war mit eigenem Stand im Jugendmesse YOU vertreten, Das Carromspiel war einer der Atraktionen des Messe. Sonntag, 18. September: 11:00 - 16:00 fand Länderkampf Deutschland - Indien im Stadtteilzentrum Lichtenber, Landsberger Allee 180 D, 10369 Berlin. Praksh Gaikwad gewann gegen Tobias Krüger mit 2:0 und gegen Peter Böcker mit 3:1. From the left: ICF & ECC President Arif Naqvi, Asian Champion Prakash Gaikwad, Welt Champion Yogesh Pardeshi, German Vice Champion Tobias Krueger, German Champion Peter Boecker, GCF President Joerg Kijanski. Berlin, 18.09.2011. India won the 2011 5th Test match Series against Germany in Berlin. In Round one Yogesh Pardeshi beat Tobias Krueger with 2:0. First game 25:16 and second game 25:05. Prakash Gaikwad beat Peter Boecker with 2:1. 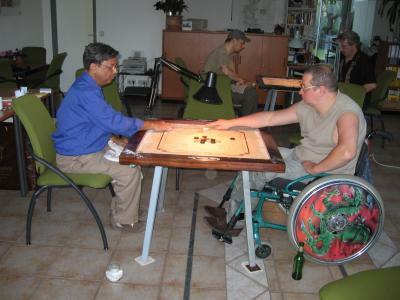 Peter defeated Prakash in the first game with score 25:20. The second and third game was won by Prakash with 25:02 and 25:01. In the second round it was almost one sided affair. Yogesh Pardeshi beat Peter 25:01 and 25:03 while Prakash won against Tobias 25:03 and 25:02. During the matches Yogesh Pardeshi made two White Slam. 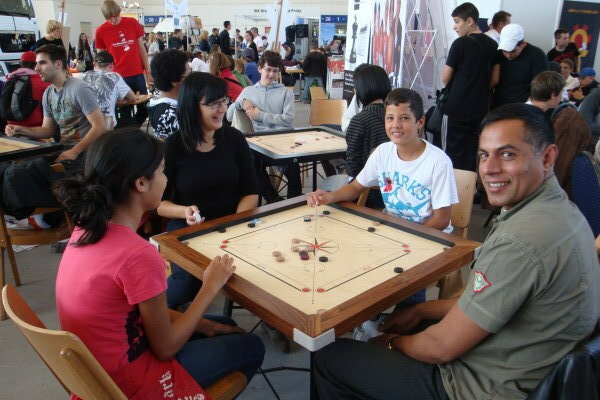 The small Indian Team is on a short European Tour for promotion of Carrom. On 19th and 20th September it will be playing Matches in Warsaw, Poland, before going to Czech Republic and Switzerland. In Zurich they will be playing on 23rd and 24th September against Swiss National Team. Indo German Carrom Test Series. Indien gewinnt das Turnier gegen Deutschland. In der ersten Runde schlägt Weltmeister Yogesh Pardeshi den erfolgreichsten Nachwuchs-Carromer Deutschlands, Tobias Krüger mit 2:0. Das erste Game mit 25:16 und das zweite mit 25:5 Coins. Prakash Gaikwad schlägt währendessen Peter Böcker 2:1. Im ersten Game des Matchs besiegte Peter den Asienmeister mit 25:20. Das zweite und das dritte Game gewann Prakash aber mit 25:2 und 25:1. In der zweiten Runde war es eine eindeutige Angelegenheit. Yogesh Pardeshi schlug Peter mit 25:1 und 25:3, während Prakash Gaikwad gegen Tobias 25:3 und 25:2 gewann. Yogesh Pardeshi spielte bei seinen beiden Games gegen Peter zwei White Slams. Das kleine Indische Team startete mit dieser Begegnung in eine kurze Europa-Tour zur Carrom-Promotion. Heute, am 19. und am 20. September werden sie Matches in Warschau, Polen spielen, bevor sie die Tschechische Republik und die Schweiz bereisen. In Zürich werden sie am 23. und 24. September gegen das Schweizer National-Team antreten. Es nahmen 40 Spieler teil darunter 8 Erstteilnehmer und 6 aus Prag.